I like to do my Book Reviews in a different manner. I review it and take notes while reading it, as I don't retain for a long period of time. By doing it this way, I can actually help you feel as you are reading it with me and benefiting from it as well. This is an excellent book. This author makes it an interesting read, as well as an intellectual tool. For example, he reminded me that there is a difference in “knowing what God's Word says, and BELIEVING it. To be a real Christian we MUST BELIEVE it. To continue with my review, this book makes you REALLY THINK and search yourself as to “I say I'm a Christian, what is the evidence”? We are created in God's image, but do I ACT the way Jesus did when he was physically on this earth? Do I Think the way Jesus did then and does now?, To do this, and be an authentic Christian, I would have to BELIEVE the way He does. 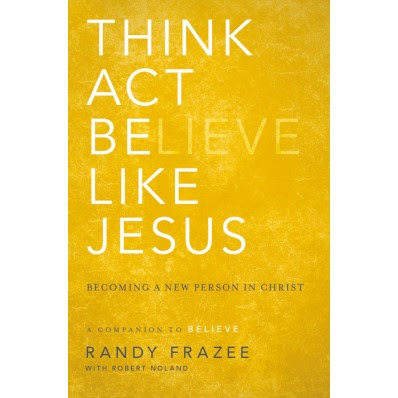 The Actual Title of this book is Think, Act Believe Like Jesus. In other words we are to actually Think like He does, Act like He does and BE like He is. Yes, Jesus is the only perfect being, so we cannot totally BE like Him, although God's Word says “Be ye perfect, as I am perfect”. We are to STRIVE to be the way He is. I may not agree with everything this author says, as we have doctrinal differences, but I do know that I am learning A Lot from this book. Practical ideas, and general knowledge as well as a wonderful insight to help me continue my “self searching” is helping me. This book is broken down into Parts such as “Think like Jesus” What do I Believe?” Part two; Act Like Jesus “What Should I do?”, Part 3 ; Be Like Jesus, “who Am I becoming? Part 4; Transformation; The Think, Act, Be Revolution and Becoming a New Person in Christ. It even takes it a step further and has an Appendix which covers Taking it To the Next Level”. As I said, I am writing this as I am reading, so you will get the full idea of what this author is trying to convey to us. I am enjoying this book completely. I look forward to seeing and reaping the benefits of putting this book to work in my life and becoming a better Christian as well as creating a closer relationship with Jesus. It reminds me, yes, I said I receive Jesus as my Savior, but how serious am I? Just as Colossians 2:6-8 says, “Just as your received Christ Jesus as Lord, continue to live your lives in him, rooted and built up in him, strengthened in the faith as your were taught, and overflowing with thankfulness. This shook me to my bones. I love to say I'm a Christian. I am Not afraid of the Gospel of Christ, but how do I show it? Do I walk the walk and talk the talk? Would God look at me and say “well done thy good and faithful servant at this point? I think I need to check myself, and re-evaluate myself. This is what this book has done for me. It is not only someone's views, or help because of personal stories and events, but he actually helps us to put this book to work and apply these strategies of helping us to become better Christians in our hearts as well as our minds. He helps me to realize that ACTIONS SPEAK LOUDER THAN WORDS. I recommend this book highly for anyone who finds themselves wondering if there is more to being a Christian than lip service, knowing scriptures, and good deeds. There is so much more. Read this book! I guarantee you will consider it a blessing! Have a great day! May God Bless! 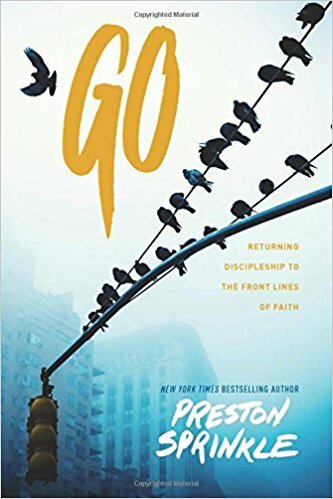 I have just been reading a book titled "GO" by Preston Sprinkle. It was sent to me by NavPress, a Division of Tyndale Publishing for my review. This will be my honest opinion which has not been compensated by any means other than this complimentary copy of the book for review. The title of this book peeked my curiosity. Two little letters.... G O. At first, I thought it was going to be an "instructional book" on how to "go" out and witness to others. It was far from it. It was a wake up call to me. It took a while for me to really get interested in it, but once I realized how close to home it hit, my eyes opened wide. It showed me that there is much more to being a "disciple "of Christ than sitting on a pew and every once in a while telling someone how Jesus loves them, and that they need to be saved to get to heaven. I'm the one who sits on the pew and listens to God's message intently. I go up to the altar and pray that He would find some use for me. I'm good at telling others that we as Christians are suppose to "go out into the world and tell others about the Wonderful News, that Jesus loves them and He died so that they (we) could be saved and spend eternity with Him. I have since understood that anyone can attend church and sit on a pew. Nowadays, so many churches are being used as a "social club". Yes, people come to hear a sermon, but they are more interested in the social aspect of it, and being able to say "I go to church, so I'm a Christian". We really need to do some soul searching. What are we truly there for ? What do we "Expect" to get from the service? Yes, God tells us to come with expectations. Now, lets see if I can get back on track and tell you what this book helped me realize. First and foremost it made me look at myself. I don't know how to approach people unless I am friends with them and we get into a normal conversation, then I feel comfortable enough to expand on the message of Jesus, therefore I don't feel that I am a good witness, let alone a disciple. During my reading, I find that while Bible Studies, Sunday School, and such are essential to discipleship, it is incomplete without mission. Mission is central to discipleship. Unfortunately, "mission" is not often included in the Church's purpose. They want to focus on teaching and learning, or on Christians socializing with other Christians. Yes, this is all good, but mission is the most important. People are hungry to do outreach such as confronting poverty, fighting injustice, just doing good for their community in a meaningful capacity. This is an integral part of discipleship. To be a good disciple, I need to study God's Word, to live God's Word. I need to envelop myself in it and believe it with all my heart. ( I thought I did, but after examining myself, I have a lot of work to do. Of Course, the book went into greater detail, and I would definitely recommend this book for anyone who is serious about doing more and getting serious about their walk with God. "GO" be a disciple. Have a Wonderful Night and May God Bless!